With all the never-ending craziness on this amazing planet, it's easy to forget that there is an infinite universe all around us. 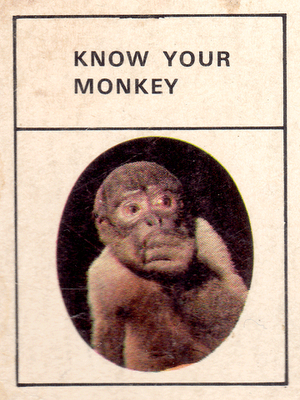 On Gizmodo was a link to a Time photo gallery of 'Number 65' aka 'Ham' the space chimp. Although a few monkeys of different kinds were sent up before him, Ham was the first chimpanzee to leave the atmosphere 50 years ago. I'm not sure I feel bad for these furry astronauts, since they seemed to have been treated pretty well... other than being tied to a rocket & blasted into the unknown Void. What these animals experienced is probably equivalent to a super-intelligent being placing a human into some kind of unfathomable object, propelling the person into an unseen hyperspace dimension. Of course, that would be awesome. Saw this nugget of wisdom on Ffffound! 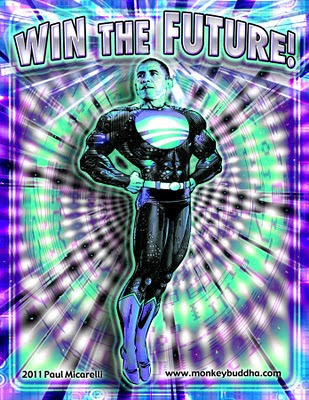 State of the Union 2011: WIN THE FUTURE!!! Last night I watched President Obama's speech & can say I at least generally agree with his rhetoric. Despite the lunatics who think someone like Sarah Palin would be a better President, most Americans see that Obama is doing a good job. He hasn't approach everything in a way that I would consider optimal, but it's easy for any one of us plebeians to complain. Any reasonable person should appreciate sane leadership after watching the two response speeches. The official GOP response was a snoozer from Paul Ryan, a Ayn Rand acolyte who wants to spearhead the Republican effort to sacrifice Medicare & Social Security to the insatiable beasts inhabiting Wall Street. Paul Ryan "The FlimFlam Man "
A second, even more far-out Right-Wing response was the predictably bizarre & misleading 'State of Teabagger Land' speech by ol' crazy eyes herself, Michele Bachmann. 5 years ago, nobody would have imagined the disciplined GOP machine fracturing like this, but they've turned into a madhouse. The recurring theme of Obama's speech, "Win the Future" was really funny to me. It's a kind of absurd phrase, exactly like Dubya's idiotic "War on Terror"- except with obviously a more positive tone. Like the 'Terror', the Future never actually ends... so how the hell can you declare 'war' against something or 'win' something that has no possible point of completion. I think they make these irrational phrases up just to scramble people's minds- like a propagandist Zen koan. Anyway, the President's repeated phrase "Win the Future" inspired me. 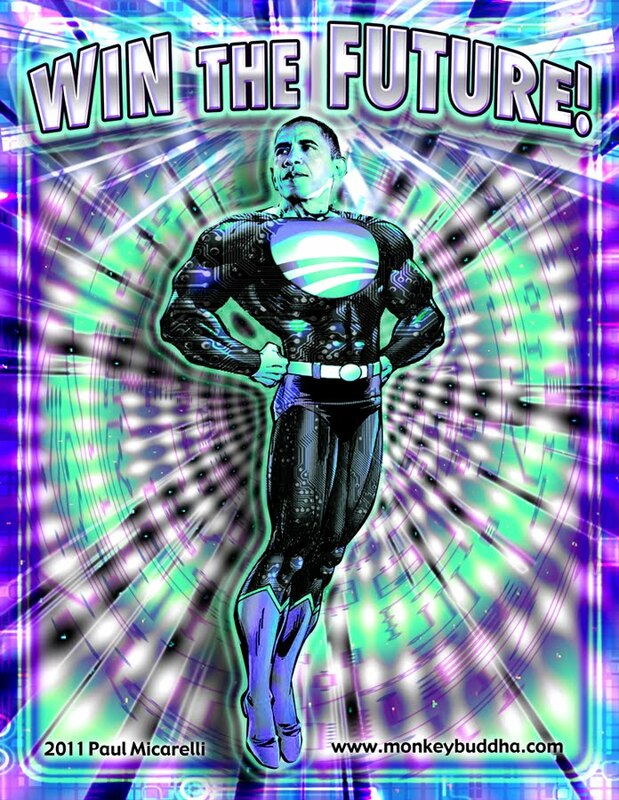 I immediately thought of making a graphic of 'Future-Obama' emerging from a mind-bending time warp. Last night, right after the speech I had to start it & got it mostly done. I finished it tonight so I could post it... before The Future arrives! President Obama's giving the State of the Union speech. People inevitable say such speeches are a lot of hot air, but in reality they can help define a sense of national purpose. "Important State of the Union Addresses in History"
Beyond simple-minded nationalism, it's important for a country to come together as a productive, creative community. The President is one person, but in these kind of speeches he can communicate common goals and policy ideas to the nation-at-large. The obvious focus of his priorities should be increasing jobs, research, investment, and development of a fair economic playing field, both domestically & internationally. Usually, the SOTU address is an uninterrupted platform for the President. Of course, there are exceptions, like knuckle-dragging Congressman Joe Wilson who will always be remembered for yelling like a moron during the 2009 SOTU. This year the only sideshow entertainment we know of so far is the special post-speech performance from GOP/Teabagger Co-Queen Michelle Bachmann. The Congresswoman is well known for her regular supremely ignorant or cynically misleading statements. Tonight she will shine, though, hopefully laying out her 'State of the Bizarro World' speech with an unmistakable kookiness that only she can provide. Please, God, let my 2 favorite right-wing ladies run against Obama in 2012!!! yakyakyak screeeeech! yakyakyak yakyakyakyakyak screeeech!" This video captures the wonder that space discovery & exploration should instill in all of us. It uses dialog by Carl Sagan with imagery from our amazing planet as a kind of public service announcement for the mission of expanding human civilization into The Universe. This eventual exodus from Earth is the only way to guarantee the long-term survival of our species. Napoleon Dynamite is one of those comedies that I can watch over & over & over. It's also a favorite source of quotes for me and my family. Napoleon Dynamite: Well, nobody's going to go out with *me*! Napoleon Dynamite: Yes... probably the best that I know of. 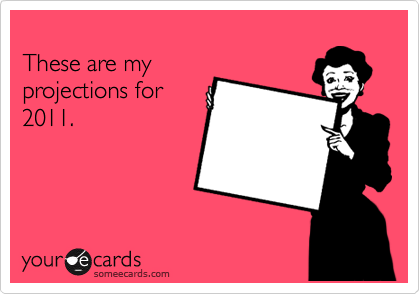 Pedro: Just draw a picture of the girl you want to take out... and give it to her for like a gift or something. Napoleon Dynamite: That's a pretty good idea. After the video lobotomy from my last post... I need some more enlightened inspiration. This call for a world-wide fellowship that lifts neighborly concern beyond one's tribe, race, class and nation is in reality a call for an all-embracing and unconditional love for all men. This oft misunderstood and misinterpreted concept -- so readily dismissed by the Nietzsches of the world as a weak and cowardly force -- has now become an absolute necessity for the survival of man. When I speak of love I am not speaking of some sentimental and weak response. I am speaking of that force which all of the great religions have seen as the supreme unifying principle of life." I saw this video on BoingBoing & it's now being linked all over the place. I have no words except... mind-boggling. Like most of the country, I've watched the events surrounding the sad shooting in Arizona this week. Although I'm a pacifist & never resort to violent measures, I know plenty of gun owners and see nothing wrong with citizens owning firearms. The 2nd Amendment is an important guarantee of American freedom to defend oneself. We don't live in Utopia, and if you ban guns, then only criminals will have them! However, society will always need continual improvement to the way we keep weapons out of the hands of violent psychos. As a professional artist & creative person, I'm also a firm believer in Free Speech. Like anything else, though, it's not an Absolute. I think people should be able to express themselves however they want, as long as they don't directly threaten or physically harm other people. Although it's not something that should be legislated, it's society's duty to find checks for expressions of dangerous intent. There has been a media circus surrounding the reactions to this tragedy & political narratives being played out. 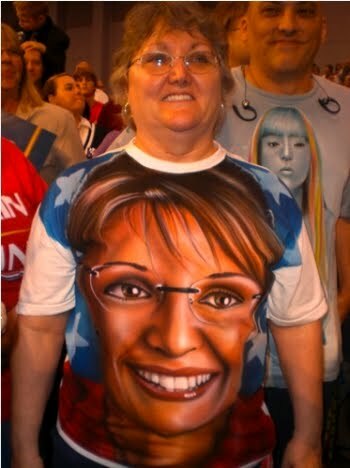 Before the President showed her up- by taking the highest possible ground in his speech last night- the person in the center ring of the circus was the shrieking Alaskan Banshee herself, Sarah Palin. Plenty has already been said about the PR crisis she's in right now. Her insane, violent rhetoric & imagery has come back to haunt her after one of her political "targets", Rep. Giffords, was shot in the head. 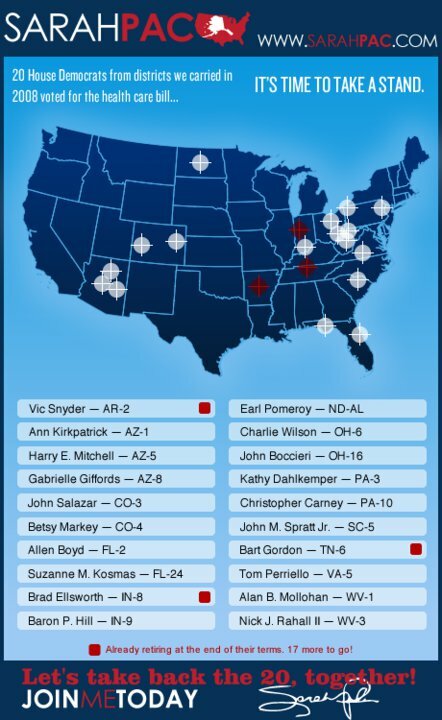 This is the now infamous Palin map image that people are using as an example of recent unacceptably threatening political language. Her staff has scrubbed the image from her website, which is a laughably futile effort, since it's all over The Internets, but also makes her look like she's trying to hide damning evidence. To make matters worse, they gave a crap excuse that the targets on her map were always meant to be surveyor's symbols. Of course, NO reasonable person is accusing Sarah Palin or other Legendary Assholes such as Glenn Beck & Rush Limbaugh of directly influencing the lunatic douchebag that shot those innocent people. What people are actually raising hell about is that those ideologues cynically poison the political & social atmosphere with misinformation. They do this in an arrogant, narrow-minded, vitriolic manner that creates unwarranted or misdirected hostility. They collectively reach many millions of people, so their influence should not be underestimated. Hopefully, this experience will incrementally improve the level of discussion in the public arena. The shallow reactionary nature of Palin, Limbaugh, Coulter, Beck, Hannity & other knuckleheads isn't going to change, but hopefully society at large will more assertively call out their BS. In the wake of this violence, people understandably began pointing out Palin's incendiary rhetoric as a prime example of what's gone wrong in political discourse. Despite the criticism, she didn't have the good sense to be conciliatory or (in a spirit of respect)...QUIET for once. Faced with the reality of a deadly massacre with children murdered & a Congressperson almost assassinated, she managed to make it about her- and as always, she's the victim!!! To start the official day of mourning for this tragedy, she released this unbelievably obnoxious video that is like psychological torture for me to sit through. The speech The President gave at the memorial proves once again that the American people chose the far better candidate in the last election. 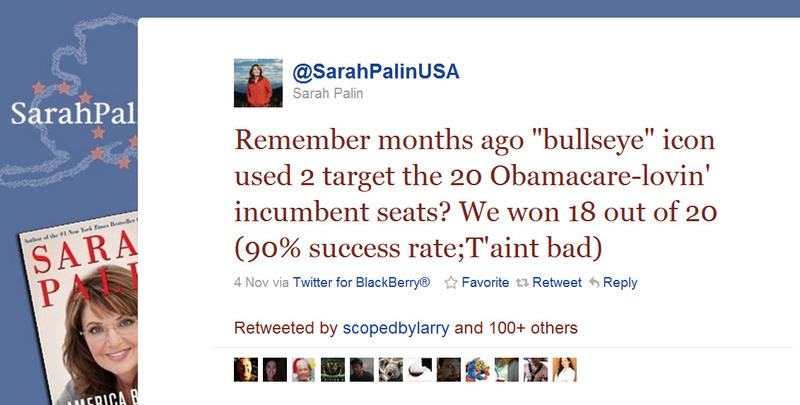 The idea that so many voters actually believed that McPain should run the country is simply frightening. It was definitely a moving speech that shows the thoughtfulness & understanding that got him elected. The image of a true leader inspiring a stadium full of uplifted mourners was a stark contrast to the ill-timed trainwreck of Palin's contrived video message. Although Obama pleaded for a more civil public discourse, that doesn't mean people can't be aggressive in asserting ethical boundaries. Sometimes it means mocking, challenging, or exposing lies or general stupidity. What's always off-limits, in any debate, is threatening or endangering the well-being of another person. I have to instantly bury my last post...blah. ...so I'll use this amusing video of French kids puzzling over electronic tech from the last 50 years. This is a good example of the loss of cultural memory that occurs over time as new generations are adapting to new realities & technologies. Unfortunately it also makes me feel real old. This is absolutely insane behavior & vile beyond belief. To the Rat King's credit, though, he did make a conscious decision to get help for his... situation. The person featured in the other half of the episode was a Cat Lady who was also a compulsive hoarder. She wanted nothing to do with the cleanup effort & was being totally unreasonable. They should've taken all her cats, dumped them into the Rat House & let em go at it. The show Hoarders is a topic of frequent discussion in my family. Some of the stories are pretty shocking & they are all uncomfortably revealing. People have literally drown themselves and their homes in "stuff" or animals or both. I think it's good to show these things, even if it is slightly exploitative. It's an instructive warning to people to face their issues & come to terms with their problems before their life turns into a complete disaster. 'Outer Space' is one of those general topics that is naturally fascinating to most people. From the time we're kids we wonder what's out there. It's an infinite mystery that's impossible for even our collective minds to completely understand. 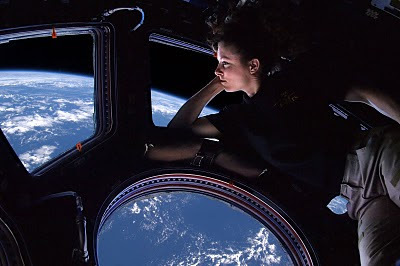 These photos I saw linked on DailyGrail.com evoke the amazing views from our very local area of space, from the orbiting International Space Station. The gifts range from the *truly* absurd to the totally lame. There are also a few gifts shown that I actually think are pretty awesome. 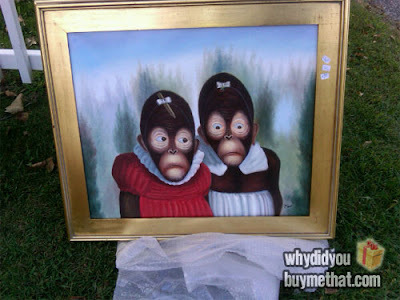 I just had my own personal weird gift experience. I posted photos recently about my surprise gift on Christmas Eve. Getting wacked-out gifts can be funny, even if they are useless. Now that all the holiday partying is over, 2011 can begin in earnest. I'm all for a politically-balanced government, but a comprehensive Republican agenda is seemingly non-existent. These clowns want to cast a cynical symbolic vote for "Repealing the Job-Killing Health Care Law" but have proposed absolutely no mechanisms to deal with the issues that the legislation addressed, however imperfectly. Invariably, anything that benefits the poor, decrepit, or the elderly will be attacked by those politicians that shamelessly bow before their corporate overlords... who in turn worship their master- God Money. Insatiable love for money is a source of endless evils in the world, but on the other hand money is a standard of interaction that is crucial for basic integration into society. It's one of those things that's easy to take for granted... unless you don't have any! On a more positive note to start the New Year, I saw this video online that somebody filmed and posted on Youtube. A homeless guy in Ohio regularly stood by a freeway with a cardboard sign describing his unique voice in the style of a voice-over or radio announcer & showed his talent for the camera. In this crazy, crazy world of instantaneous feedback, the video has gone viral. The man was offered various jobs & now has an opportunity to put his life in order. If he can keep himself together in spite of the attention & shocking transition period, it will be an amazing example of the power of technology tapping into a human social potential that we are barely beginning to understand. This was an miraculous example of opportunity for one person, but it's just one person. There are millions of lost souls in the world who don't have any opportunities from a talent, skills, or even the relative sanity that Ted seems to at least have. Human misery may be an unavoidable fact of life. However, a story like this can remind us that no matter how horrible our situation may seem, it's still possible for things to get better.